It’s getting hot in here! And with recent drought and wildfire battles underway in many areas of the country, the time is now to get ready for hot temperatures and lots of sunshine this summer! Arm yourself with this list of crucial summer safety tips to help you stay protected this outdoor season. The sun provides vitamin D, which helps our bodies absorb calcium and build strong bones and teeth. However, it can also be dangerous. Sunlight is composed of invisible UltraViolet (UV) rays. The UVA and UVB wavelengths are our primary concern, because they penetrate the earth’s atmosphere and our skin. Too much exposure to these rays can cause cumulative damage over time, including premature skin aging, skin cancer, and eye damage. Try to avoid the strongest rays of the day, which in most areas occur between the hours of 10 AM and 4 PM. In some southern states, the hottest part of the day is actually after 4 PM. Before you head outside, check your local news source for the UV Index for that particular day. Additionally, the Environmental Protection Agency (EPA) posts the UV index on their website and via a variety of smartphone apps. UV Rays = Find Shade! UV rays reach the earth’s atmosphere throughout the year, even on hazy day. However, they become more intense in the spring, as temperatures get warmer. Some UV rays are able to pass through standard car, home, and office windows. Depending on the type of tint, tinted windows can help block UV rays. UV rays can also penetrate a water surface, so skin can burn even if you’re in the water. Sand, water, and snow reflect sunlight and increase the amount of UV radiation you receive, so be especially careful in those areas. If you plan to be outdoors, scout the area for natural sources of shade or take cover under an umbrella or patio. 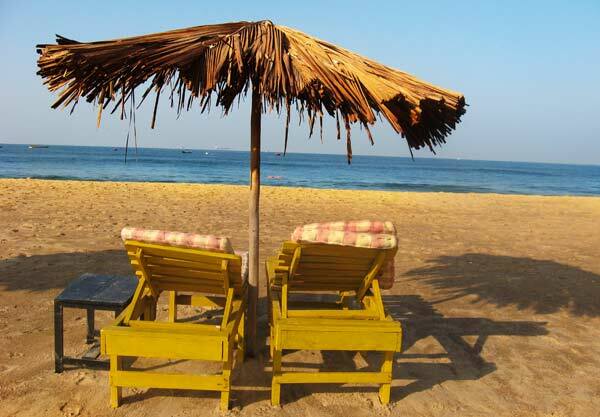 We recommend this Rainbow 8′ Beach Umbrella with Carry Bag (View on Amazon) from Shadezilla. Sunscreen protects against the sun’s rays, but not all sunscreens provide complete protection against all UV rays. Sunscreen is available in many forms, including lotions, creams, ointments, gels, sprays, wipes, and lip balms. Some cosmetic brands contain sunscreen as well, so check the labels and opt for the brands with at least SPF 15 for everyday use. This Banana Boat Protect and Hydrate Sunscreen Lotion SPF 30 (View on Amazon) should do the trick! The SPF number indicates protection against UVB rays only. While there is no standard system for measuring protection from UVA rays, sunscreen products labeled “broad-spectrum” provide protection against both UVA and UVB rays. PABA-free sunscreens providing broad-spectrum protection with SPF 30 or higher are recommended. No sunscreen product can completely protect you, but higher SPF numbers mean more protection. However, the higher the number, the smaller the difference becomes. SPF 15 sunscreens filter out about 93% of UVB rays, SPF 30 filters about 97%, SPF 50 filters about 98%, and SPF 100 filters about 99%. Check the expiration date on the packaging to ensure it is still effective. Most sunscreens have a 2-3 year shelf life. Additionally, sunscreen products may irritate your skin. Even if the product label claims it is hypoallergenic or dermatologist tested, you should test it before you use it. We usually do not apply enough sunscreen, so the actual protection we get is less. Even with proper use, sunscreen should not be considered a way to prolong your time in the sun. Some UV rays always get through, so using other forms of sun protection is also important. About 1 ounce of sunscreen is enough to cover the arms, legs, neck, and face of the average adult. Pay close attention to areas not covered by clothing, especially your face, ears, and neck. 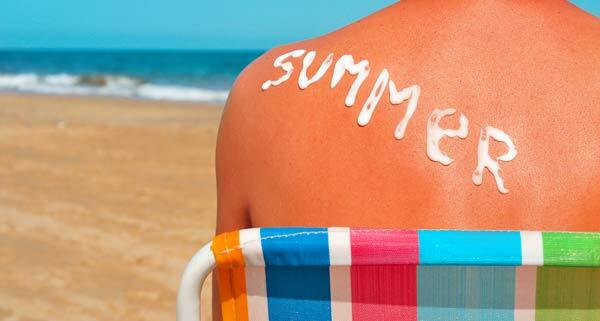 Apply sunscreen about 20-30 minutes before sun exposure, and for best results, reapply at least every 2-3 hours. If you are swimming, engaging in other water activities, or sweating, apply sunscreen more often. Sunscreens labeled “waterproof” provide protection for at least 80 minutes even when you are swimming or sweating. However, sunscreens labeled “water resistant” may protect for only about 40 minutes in these conditions. Clothes provide different levels of UV protection. Long-sleeved shirts, long pants, or long skirts cover the most skin and are the most protective, and dark colors provide more protection than light colors. Tightly woven fabric protects better than loose weave clothing, but be aware that fabrics do not block out all UV rays. If you can see light through a fabric, UV rays can get through, too. Some companies now make clothing and swimsuits that are lightweight, comfortable, and have special coatings to help absorb UV rays. These clothes usually have a label listing the UV Protection Factor (UPF) value, which is the level of protection the garment provides from UV rays. The higher the UPF, the higher the protection from UV rays. 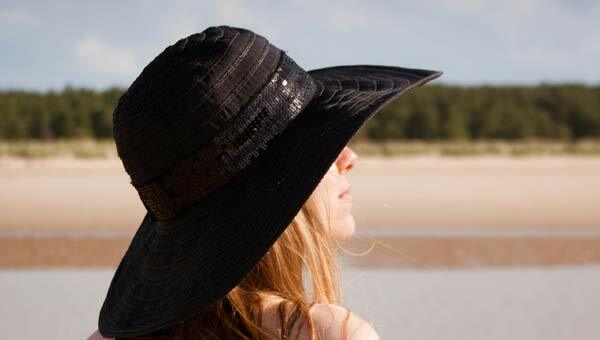 A hat with a brim of at lease 2-3 inches can protect your ears, eyes, forehead, nose, and scalp. A hat with a dark, non-reflective underside to the brim helps lower the amount of UV rays reaching the face from reflective surfaces. Hats are now available with UPF values as well like the Sloggers Women’s Wide Brim Braided Sun Hat (View on Amazon). Research shows that spending long hours in the sun without eye protection increases your chances of developing certain eye conditions. UV-blocking sunglasses are important for protecting your eyes, as well as the delicate skin around them. All eyewear, including prescription glasses and contact lenses, should absorb the entire UV spectrum. However, contact lenses do not cover the whole eye and do not provide sufficient protection on their own. Sunglasses should block 99% to 100% of both UVA and UVB rays. Wraparound sunglasses and those with large frames help protect your eyes from UV rays hitting your face at different angles. Before you buy a new pair of sunglasses, check the label. Glasses with “UV absorption up to 400 nm” or “Meets ANSI UV Requirements” on the label block at least 99% of UV rays. Sunglasses with “cosmetic” on the label block about 70% of UV rays. Dark glasses do not necessarily provide more protection. We love these Maverick Polarized Sunglasses (View on Amazon) for function and fashion!Additionally, children need smaller versions of real, protective sunglasses, not toy sunglasses. 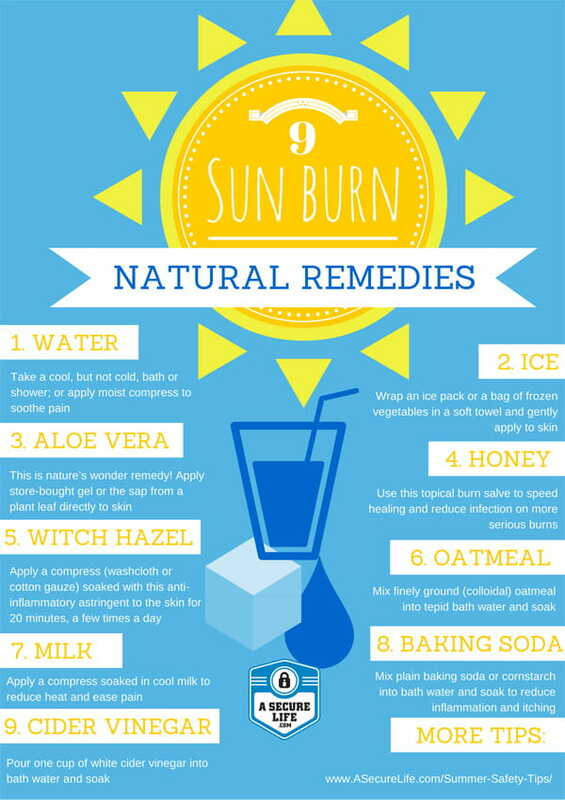 Occasionally, we all suffer from sunburns, so here is a list of natural sunburn remedies made from household items in a beautiful infographic you can share with your friends. Do not apply ice directly to the sunburn, or you risk further damaging your skin. Also, remember not to scrub your skin with rough towels or use products like oils, bath salts, or exfoliants. The U.S. Food and Drug Administration (FDA) has released a video it insists clarifies the effectiveness of sunscreen products and helps ensure their proper labeling and manufacture. To stay safe in and around water, take precautions based on your location. Check for potentially hazardous water conditions and weather before you head out. Additionally, use proper fitting, Coast Guard-approved flotation devices when on a boat or other watercraft. 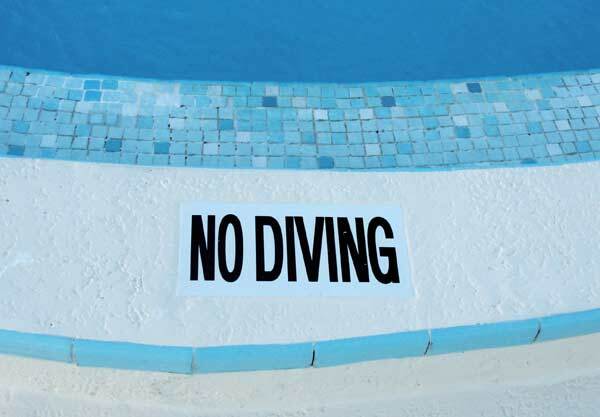 Unlike a pond, lake, or swimming pool, a beach has special dangers like currents and tides, so always check the water conditions before you swim. Rip currents and/or undertow can form in any large open water area, breaks in sandbars, or near jetties and piers. They are responsible for numerous deaths on our beaches every year. If you are caught in a rip current, stay calm and try not to fight the current. Swim parallel to the shore until you are out of the current, then turn and swim toward the shore. Whether you’re swimming, surfing, boating, or just hanging out in your sunny backyard, keep this quick list of tips in mind. Have a safe and happy summer! Look for warnings about dangerous water conditions. Check weather reports for nearby thunderstorms or other threatening weather. Supervise young children while playing near water or swimming. Swim in areas roped off for safety and where a lifeguard is on duty. Wear properly fitted U.S. Coast Guard-approved life jackets. Keep hydrated and take breaks in the shade. Keep poles and life preservers near swimming area. Watch out for jellyfish and other dangerous wildlife. Surround pools with a fence at least 5 feet high. Don’t dive into water when you are unsure of the depth. Never swim or drive a boat after drinking alcohol. Don’t use inflated water wings, water noodles, or other toys as life-saving flotation devices. 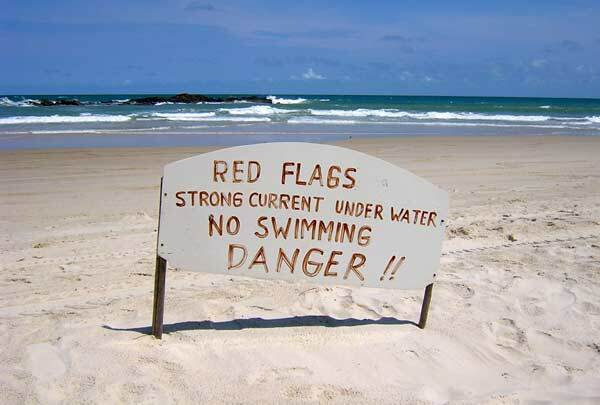 Never swim in rough water conditions. Never leave toys in the pool after swimming; children may be tempted to return to the pool unsupervised. In addition to the sun and water safety tips we mentioned above, pack a bag (same idea as a 72-hour kit) with the essential items we sometimes forget to grab on our way out for some fun in the sun. Sunscreen – Must protect from UVA and UVB rays. Hat – Wide brimmed and ventilated are best. UV protective sunglasses – Wraparound glasses best protect from sun’s rays. Towels – Extra towels can provide sun shade. Water – Refillable water bottles if a fresh, potable water source is available. Snacks – Portable, nutrient-rich snacks that won’t spoil in the sun.